A long-running project to transform an abandoned toilet on Clapton Common into a community hub has received a boost after local leaders joined forces to back a final fundraising push. The loo had been derelict for nearly 20 years when a group of residents put forward a plan in 2014 to turn it into a village hall. They formed the Clapton Commons Community Organisation (CCCO), along with a number of local organisations, which has since worked with the Town Hall to bring the idea to life. The council has pumped in over £200,000 to kickstart the restoration work, but CCCO will need a final £50,000 to kit out the building. Mayor of Hackney Philip Glanville joined faith leaders at the building earlier this month to ask for the public’s help. Once the funding is secured, the block will be on its way to becoming “Liberty Hall” – a 700 square-foot venue replete with a community kitchen, event space and a bike repair clinic. The Bishop of Stepney, the Rt Revd Adrian Newman, said: “This new village hall is the result of many different community groups coming together with a common goal. 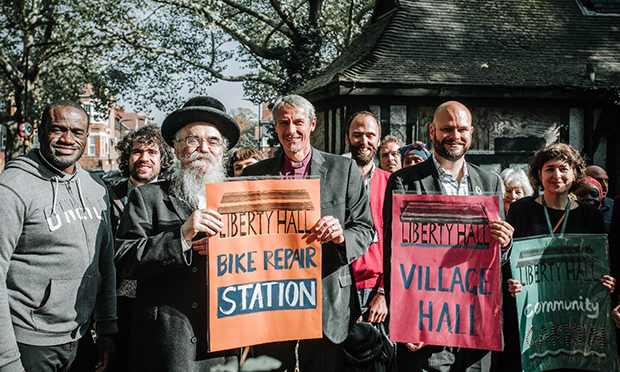 Rabbi Avrohom Pinter, principal of Yesodey Hatorah Senior Girls’ School, added that the inclusion of a bicycle repair clinic was an “excellent idea”. CCCO co-director Mike Abrahams hopes the space, and its focus on healthy eating, will foster cooperation between people of different backgrounds in the local area. Local charity Made in Hackney – the initiative’s primary “food champion” – will use the kitchen to host cookery lessons and food-growing classes. The charity’s founder Sarah Bentley said it is a “real privilege to be at the heart of such an exciting local community”. Organisers hope Liberty Hall will open in summer 2019.